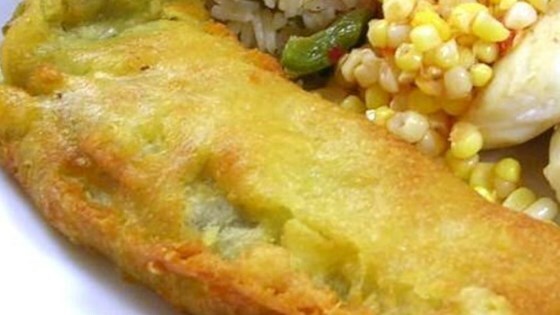 "Delicious green chiles stuffed with cheese, dipped in a special batter and fried in canola oil." Remove seeds and membranes from peppers. Stuff each pepper with a strip of cheese. In a small bowl combine milk, the 1 cup flour, egg, baking powder, baking soda, salt and canola oil; mix well to make a batter. Pour enough oil in heavy frying pan to reach 1 inch in depth and heat over medium-high heat. Roll each pepper in the remaining flour and dip in the batter. Fry until lightly browned on both sides. Use canned green chiles, or char fresh green chiles over a flame, then peel them. Remove seeds and membranes.